CATCH this Jack if you can! Surprise!... 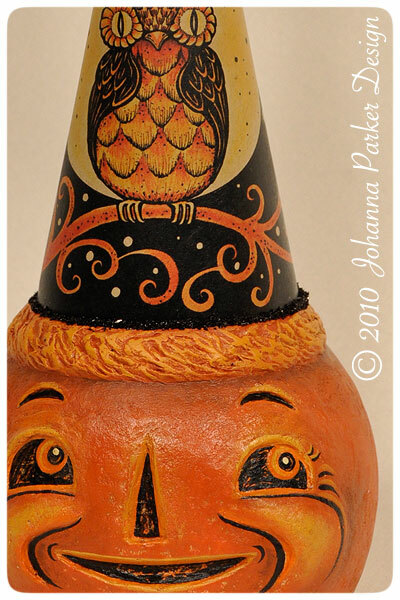 I just finished this fun one of a kind jack-o'-lantern character! And now, "Jack-a-Jillian" is ready for adoption! GO to my WEBSITE to see details and be sure to click on the image for more views and descriptions once you're there. Please send me an email if you'd like to adopt this one of a kind jack wearing one of my whimsically illustrated Halloween party hats! Later, I will update the page to reveal who caught this collectible piece!....For now, it's late, and I'm growing rather sleepy....zzzzzzzzzzzzzzzzz . . . . .
UPDATE: I thought I was the only one staying up late last night, but looks like my friend Celeste was too! I think she wins the prize for catching the most Collector's Catch pieces! How many is that now?..... Maybe 3 or 4? I'll have to check my records :) Thank you!